Your vote for Worst/Best Dressed at the Oscars?? Best: I am not a fan of Gwyneth, but I have to say she got my vote with the stunning Tom Ford dress. Also loved Octavia Spencer. She was beautiful and I was so happy she came out a winner. Although the Academy Awards seem to be the nation's way of petting the Hollywood bubble, I have always loved seeing what the red carpet has to offer. Did you watch? *Leave your True Beauty Files outfit post links in the comments section! Delicious pink with elegant stripes. That skirt is AMAZING. Plus, anything with pockets always gets extra points from me! I agree with your Oscar choices, but I also loved Michelle Williams. LOVE this. I am wearing pants this color today, which makes me really happy. How can you bW sad or mad when you're wearing such a bright, joyful color? I actually didn't watch the Oscars! Which I'm sad about now. This is such a great look! Love the mixing of the stripes with the solid and bright pink. I agree with you- thought Gwyneth looked stunning, as did Jessica Chastain!! Love, love, love this outfit! You look gorgeous! That looks truly stunning! I'm in love with the stripe and pink combo. Genius. perfect outfit! i love the stripes, and the pink goes so well with it! So beautiful Anna! You inspire me! I love the boldness yet it looks so effortless. I thought Natalie Portman was beautiful, and Jessica Chastain- looove her hair! My favorite last night was Rose Byrne (of Bridesmaids) who wore a one-shouldered black sequined gown. Simple and chic. that skirt!!! i am in love. that skirt is my fav. you look great! I am always looking for new ways to style this skirt, thanks for the inspiration! 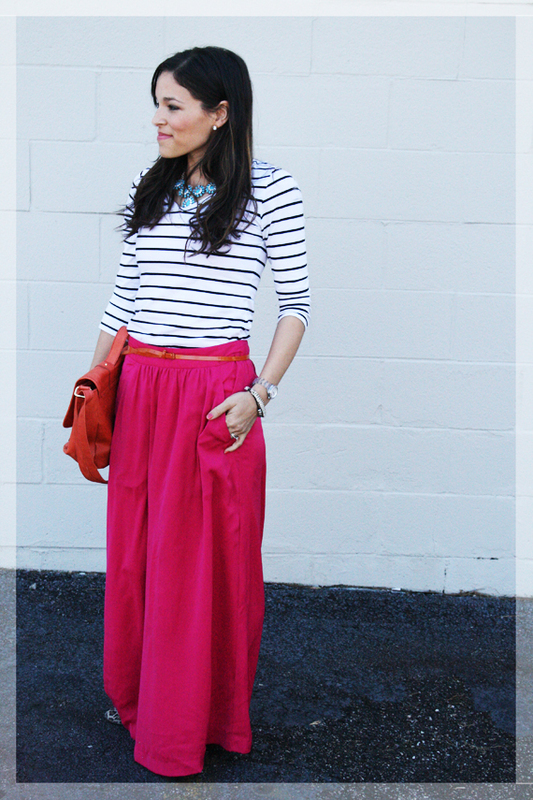 Love the way you combine bold colored skirt with striped tee - this looks new - and GOERGEOUS! Still have to unvestigate the Oscar robes - didn' watch! Yes, Emma Stone was beautiful and I agree a different color. Cute skirt by the way! That little pop of orange in your belt is the perfect touch! Love this modest, chic look. Love love love Anna! Two of my favorite things in fact. :) Linking up again today! So excited! Michelle Williams and Selma Hayek were my pics for last night! i saw this skirt at gap yesterday - it looks great on you! hope you have a wonderful week anna! Love your outfit.....you can never go wrong with stripes in my book. 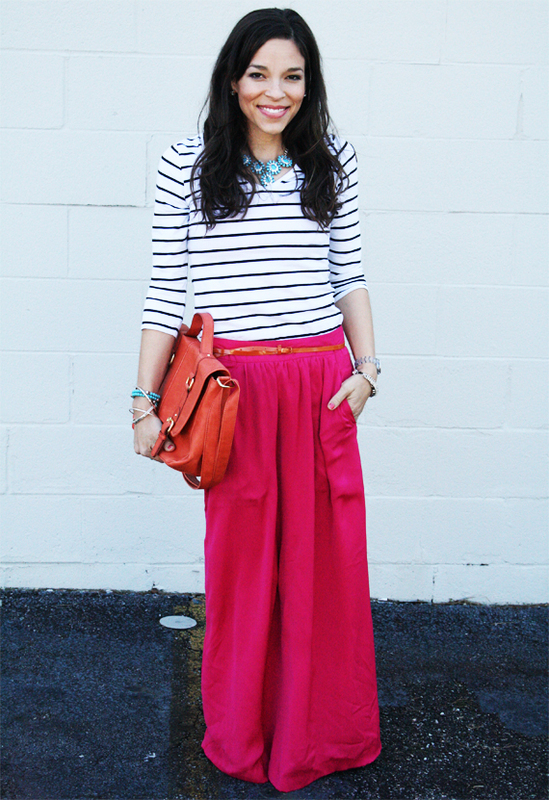 Those maxi skirts are going to be a staple for me this summer! I did not tune in. Alas, I was over all the hollywood stuff many years ago. I do love looking at the dresses though, which reminds me I need to check out eonline. I've been loving all the color in your outfit posts lately! Your jewelry is always lovely too. Is your necklace a recent find at H&M? I have that skirt! It's probably my favorite piece in my closet! Gorgeous outfit, Anna! Love love love your skirt and the remixed tangerine! Beautiful! I'm crushing on a striped shirt right now. They look good with so many things. Thank you for allowing us to do this. Happy early spring! Bright and fresh! Love that skirt!!!! girl, you are so star worthy! i am really wishing i lived near and H&M right now. loved gwyneth's dress and emma's and i am so dang happy octavia won. woot!!! I didn't make it on time for the red carpet, but saw some glimpses of the show here and there, thought that Michelle Williams was completely flawless, so beautiful! One of my favorite outfits! I really like long skirts :) You are so beautiful Anna! that skirt is fantastic--love that "covering" skirts are so in right now! win=win! Love this combo, very chic yet simple. The pops of colour are amazing! This outfit is GORGEOUS! And I agree with you 100% re: Oscars. That skirt is to die for! Must find one and put it in my closet! Great outfit. Another great look! I have a similar striped shirt and it's one of my favorite pieces. I feel like I'm the only one who didn't like Michelle Williams' dress. The color was great, I just didn't care for whatever was happening on the dress's midsection. Loved Penelope Cruz, Octavia Spencer, Emma Stone, and Gwyenth Paltrow's dresses. pretty lady! this may be my favorite so far! you look beautiful! and this post could not have come at a better time; i bought the identical skirt over the weekend and was brainstorming ways to wear it. here it is! i'm thrilled. you work it so well. You're totally making me regret not getting that skirt when I found it on super sale! I'm such a fool! We could have been skirt twins! oooh i want that skirt! love that pop of pink. :) as for the oscars, i loved Jessica Chastain, Emma Stone, and Viola Davis. so stunning! You are gorgeous!! I adore this outfit. Love the stripes with the maxi skirt! You are SO CUTE! LOVE these pants on you! You are so adorable!!! 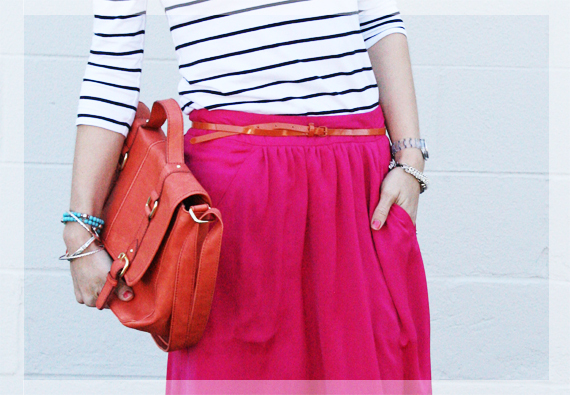 I love the bright maxi skirt paired with the stripes. Super fun for winter! amazing skirt - looove the color! and I missed the oscars =( but yes, Gwyneth was gorgeous!! Love the bold colors mixed with the simple stripes - they go perfectly together! Did you know that the skirt that is similar to yours is on sale and there is a 15% off code for today only! Amazing. Only thing I'm sad about is it not having pockets! haha. Ahh...swooning big time over that maxi! The color is perfect! I can always be counted on to love anything that has to do with magenta (c; And I love the turquoise paired with it! My vote is for Michelle Williams, she looked absolutely gorgeous...good for her, she is so darn cute! Bright pink and orange is one of my favorite color combos, so of course I love this look! That skirt is amazing--I love the pockets! 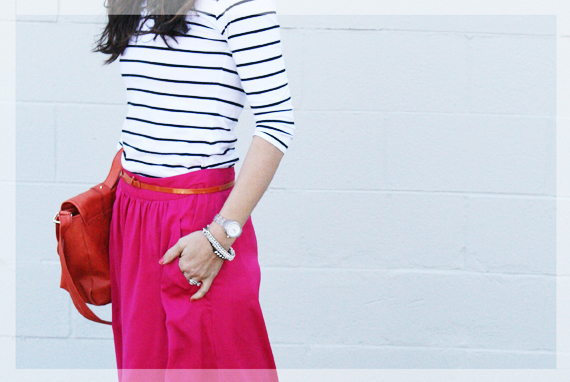 Love basic stripes paired with a bold bright color. hey you just look wonderful in bright colors and i totallz love the combo! suits amazing with your skin! I just wore something so similar! But mine wasn't a maxi. I just love pink this season!! I watched the red carpet Sunday, I loved Emma Stones dress! She is just so beautiful! Surprisingly, there were more outfits I didn't like than I liked this year. Not sure why there was so many poor dress choices. Come on, its the Oscars! Anyways, I love your stripes with bold color. Cute! That maxi skirt is HEAVEN!! Absolutely love it, especially paired with the stripes! Beautiful.